STRATEGIC focus, innovation and determination are the most important qualities in growing a successful global software business, according to Lagan Technologies founder and former Chief Technology Officer David Moody. The software entrepreneur was speaking as he visited the Jordanstown campus to meet MSc Business Development and Innovation students and course alumni. Recently acquired by a California-based group Kana Software, Lagan Technologies is one of Northern Ireland’s fastest growing software companies. 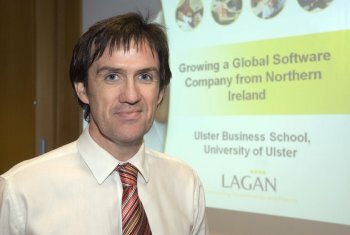 The Ulster Business School event which coincided with the announcement of David’s new role as Vice President for Solutions in Kana worldwide provided an opportune time to reflect on the development of Lagan Techologies. According to Course Director Dr Adele Dunn, Northern Ireland businesses have a lot to learn from Lagan: “In 2009 David worked with us to produce a case study of the business we are delighted he has came back to finish this chapter of Lagan’s development and give us an insight into the future with Kana.